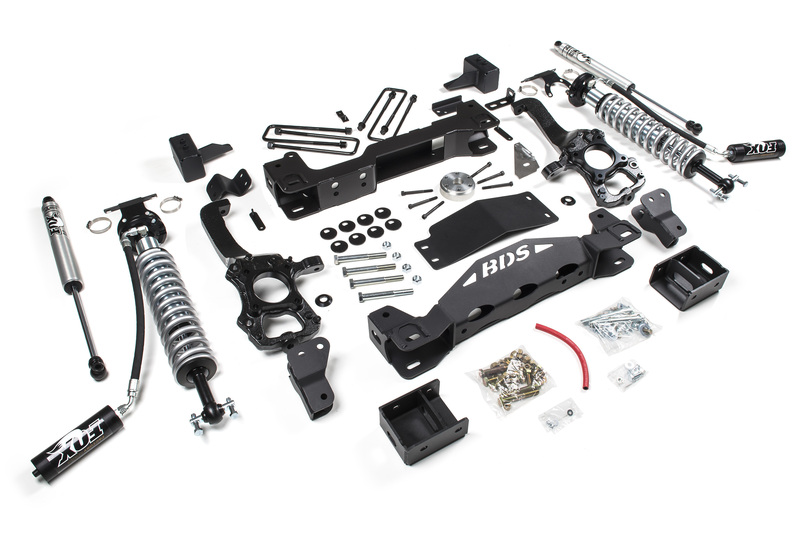 BDS Suspension now offers a 4″ Performance Coilover System, adding to the current lineup of 2.5″, 4″ IFS, 6″ IFS, and 6″ C/O systems for the redesigned 2015 Ford F150 trucks. 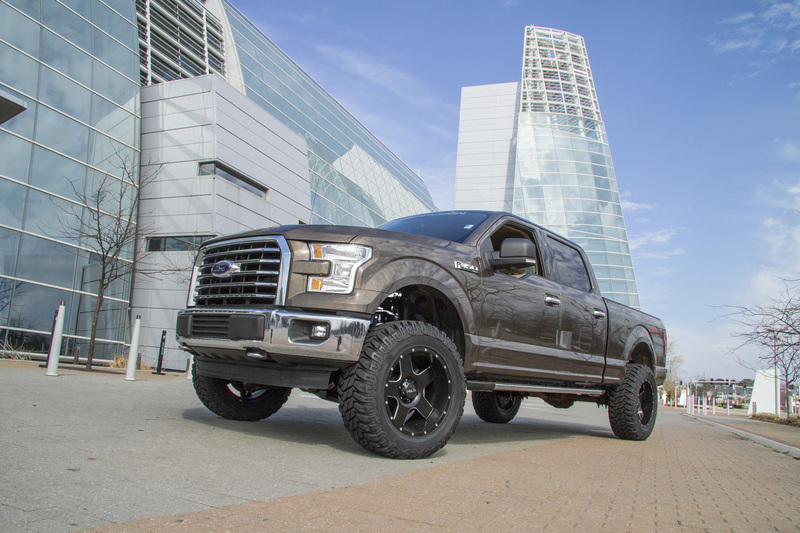 Take your truck to the next level and improve its offroad capability, drivability, and all around performance with room for 35″ tires to be installed. These new kits bring together BDS tried and true high clearance suspension technology with precision tuned Fox 2.5 remote coilovers and Fox 2.0 IFP shocks for an winning combination. As with all BDS lift systems, this 4″ coilover system includes Factory Protection Plus (FPP) for piece of mind to use it and abuse it wherever your next adventure may take you. FPP combines BDS’s No Fine Print Lifetime Warranty, FMVSS No.126 ESC system compliance testing and a 5-year 100,000-mile drivetrain warranty at no additional cost to the consumer. 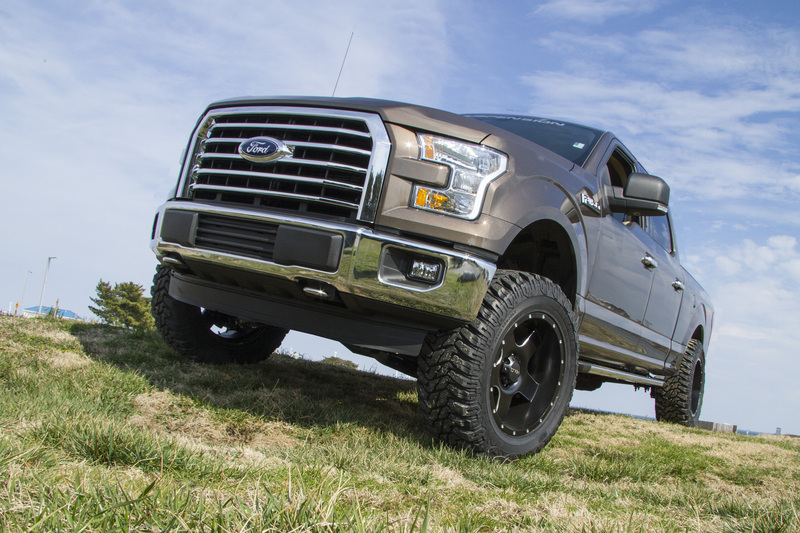 Get the most out of your new Ford F150 with BDS Suspension. 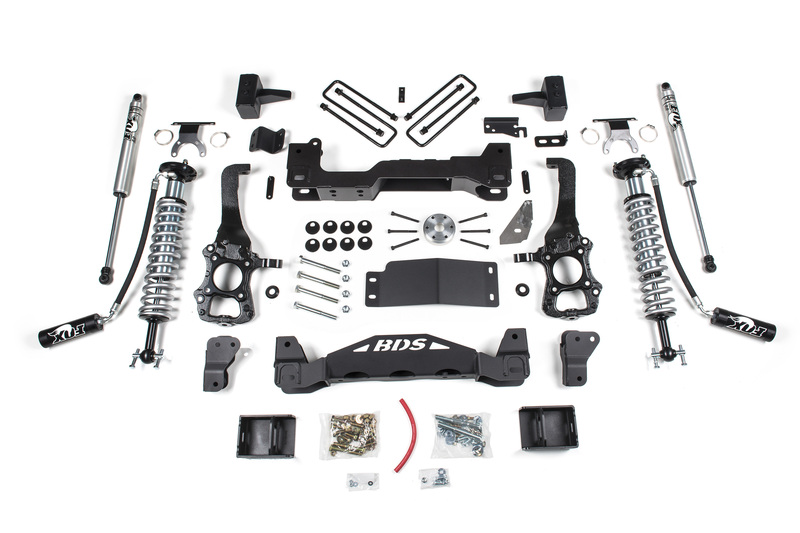 For customers already running the BDS 4″ Lift Kit (#1507H), BDS also offers a coilover upgrade option to up the ante on our current suspension lift. This new 4″ performance coilover system was designed and tested to integrate flawlessly with the new electronic stability control (ESC) systems and meets FMVSS No.126 compliancy standards for the utmost safety standards on-road. 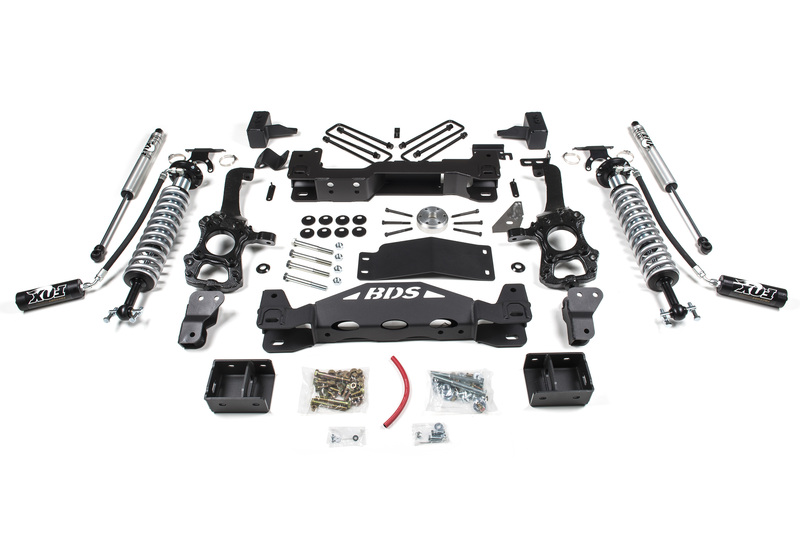 Up front the kit utilizes a pair of one-piece heavy duty 1/4″ steel high clearance crossmembers, differential relocation brackets, weld-in support gussets and a heavy duty differential skid plate to create a solid subframe for the suspension. A pair of CNC-machined ductile iron steering knuckles dwarf the factory units and reposition the steering mount to compensate for the lift. The Fox 2.5 remote reservoir coilovers come pre-tuned with Eibach coils to provide a great ride and set to provide 4″ of lift right out of the box. 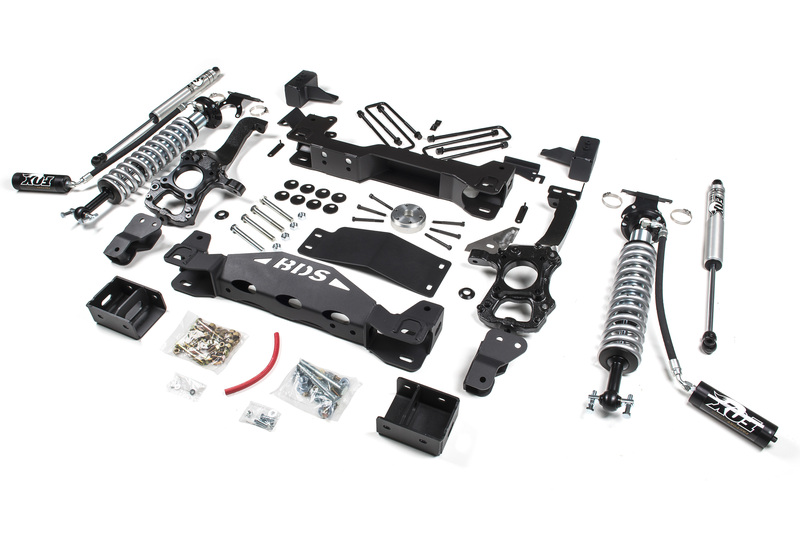 Also included are remote reservoir mounting brackets, bump stop extensions, sway bar relocation brackets, new alignment cam bolts, and a billet aluminum front driveshaft spacer to round out the front of this kit. Out back the factory block is removed and a 4″ dual pin block kit is used to provide a slightly tail high stance. Brake line extensions, an e-brake bracket and Fox 2.0 shocks round out the kit and give clearance for up to 35″ tires to be installed. 2) 18″ or larger wheels required. Stock 17″ and 18″ wheels cannot be reinstalled. Stock 20s can be used with up to a 305/60r20 tire. 3) 18″ wheels with 5-5.5″ backspacing should be dry fit prior to mounting to ensure proper clearance to BDS steering knuckles.